I am a rising junior study at Detroit Country Day School in Michigan. I came from China two years ago and started to study at DCDS as a freshman. I am a strong math and science student who has participated in many different competitions. In my leisure time, I like to sing, draw, and relax. I enjoy arts, and I am pretty good at it. In the future, I would like to major in business or engineering. 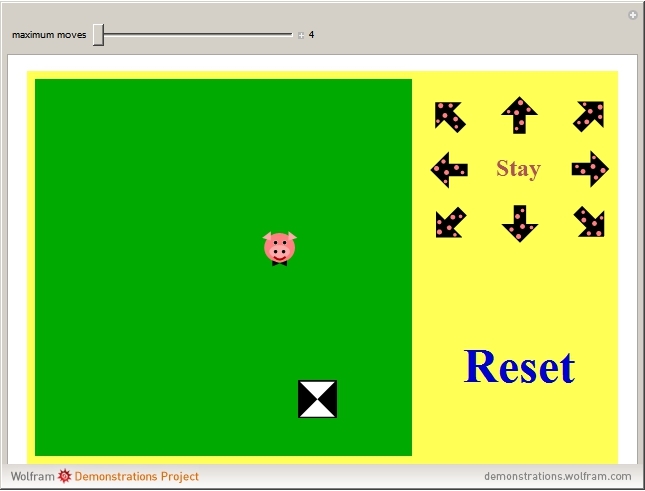 This Demonstration is a game between the pig (the computer) and the player. The goal of the player is to encircle the pig by moving the fence, which is controlled by clicking the arrows. The player can move up, down, left, right, and also diagonally. Every time the fence moves, it will leave a path on the screen. The pig's movement, which is generated by the computer, only goes up, down, left, and right. The player wins when the pig is fully surrounded by fences, which means two fences overlap. The pig wins whenever it reaches the edge of the playing field or the player runs out of moves that are controlled by the slider on the top.